The National Cancer Institute's Natural Products Branch at the Frederick National Laboratory for Cancer Research is the largest program to collect materials worldwide from marine, plant, and microbial sources so they may be studied for possible medical uses. 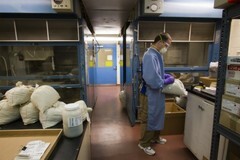 Plant collections are dried at the place of collection before being shipped to the NCI. Once in the lab, taxonomic information provided by the collector is linked through a computer database to the processing the specimen receives in the natural products lab.